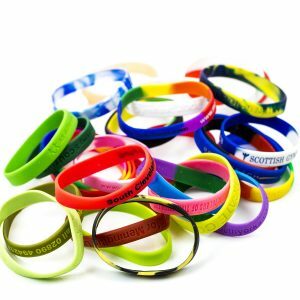 Personalised Wristbands are the perfect way of promoting and fundraising for your Charity, Company, Club or Association. They have been extremely successful and a very cost effective marketing tool. This item is the perfect giveaway it can be personalised either by printing or embossing your logo, details or message onto the band. We have a number of colours available. These are available in 100% Silicon in a variety of colours at amazingly low prices. We can manufacture bands incorporating your name, logo, design or message to meet your individual specification. Available sizes are as follows: 210x12x2mm, 202x12x2mm, 180x12x2mm.